Three aircraft-based studies of boundary-layer fronts (BLFs) werecarried out during the experiment KABEG in April 1997 near thesea-ice edge over the Davis Strait. The boundary-layer flow wasparallel to the ice edge and hence two independent turbulent regimescould develop in an identical synoptic framework, separated by thefrontal zone along the ice edge. The zone of strongest crosswindhorizontal gradients was typically 20 km wide, while the downstreamscale of the BLF was observed to be several hundreds of kilometres.For two of the three cases the investigation of turbulence structureswas possible and the results are given herein.Horizontal and vertical profiles of turbulent fluxes and other turbulentquantities are presented. A spectral analysis reveals the coexistence ofsmall-scale turbulence with roll motions. These roll motions can behidden or can be visible as cloud streets. 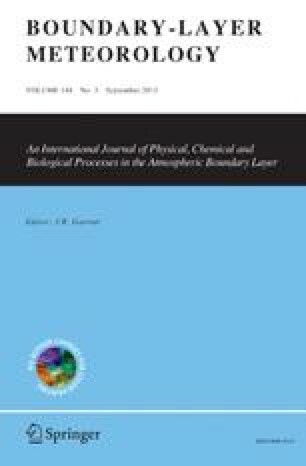 The associated transportmechanisms are highly relevant for the choice of suitable averagingintervals for turbulent flux calculations and model validation.Parameterizations for the vertical velocity variance, countergradienttransport, sea surface roughness and eddy diffusivity are evaluatedand compared for this baroclinic strong-wind convective boundary-layerenvironment. Analogously, drag coefficients and bulk transfer coefficientsare derived from measurements.